Thank you to everyone who attended the Official Opening Celebration on Saturday June 27, 2015! 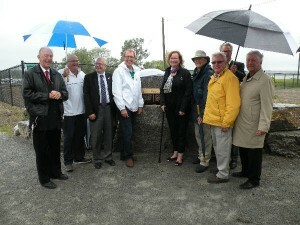 Despite the rain it was a great celebration attended by many. Please stay tuned for the Frenchman’s Bay Waterfront Master Plan coming soon! Frenchman’s Bay is located on the north shore of Lake Ontario in the City of Pickering, in the Region of Durham. Frenchman’s Bay is home to a number of boating clubs and marinas and has provided a natural calm water harbour for over a century. The harbour entrance is located at the mid-point of a natural beach bar separating Frenchman’s Bay from Lake Ontario. On July 1, 2012 the governments of Canada and Ontario announced that they will work together with the City of Pickering and Toronto and Region Conservation Authority (TRCA) to rehabilitate Frenchman’s Bay Harbour Entrance. The project will result in the creation of a safe harbour entrance while preserving and enhancing the ecological conditions. The total cost of the initiative is estimated at $9 million, with funding shared equally between the provincial and federal governments and the City of Pickering. TRCA will be the project manager for the work and will begin construction of the new harbour entrance this fall with completion expected by December 2014. The Frenchman’s Bay Harbour Entrance Project will result in the creation of a safe harbour entrance that supports the marine functions of the bay, while preserving or enhancing the ecological conditions of the bay. The project also includes opportunities for improved public amenities, waterfront access, and trails. This project is an integral part of the City of Pickering’s overall commitment to make the Pickering Waterfront a place that achieves a wide range of objectives including public use and recreation, environmental sustainability, enhanced tourism opportunities and commercial linkages. For additional information on this project, please visit the City of Pickering website.